The Municipality of Tweed is happy to announce the opening of a new store in the heart of the Village. At The Store will be having a Grand Opening celebration at 322 Victoria Street North on Saturday April 13 at 11am. Mayor, Jo-Anne Albert and the Municipality of Tweed encourages the Tweed community to come out for a meet and greet with Robert Burton and Gail McKie. Light refreshments will be served. Mayor, Jo-Anne Albert says "We are really pleased to see a private business owner stepping up and filling a void that has been identified as a need in various reports and recommendations over the past few years. We wish At The Store the best of luck and encourage residents to come and check out what they have to offer." Owner Robert Burton says "We understand that this is something the community has been asking for, with that in mind we tried to design a store layout that could cater to everyone’s needs, while being able to be price comparative to larger chains." 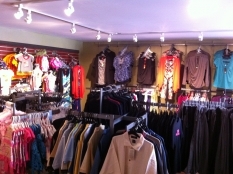 At The Store is a retailer that will offer a wide range of clothing and apparel items. In stock now are spring and summer clothing, hats, sunglasses, purses and handbags, jeans, nylons, undergarments, sandals, custom jewelry, and much more.